This SSS online registration is a complete guide how an SSS member can register their SSS account online thru My.SSS. After a member registered on SSS online, they can easily view their monthly premiums, loan balances, Employment history and their static information anytime, anywhere if internet connection is available. While this is good news to the members, most of them still prefer to visit the nearest SSS service office to inquire about their SSS account due to lack of knowledge how to use this system. To make it easy to all, I decided to prepare this simple step-by-step tutorial how to register SSS account Online. I make it simple and easy to understand by providing screenshot in every step so that everyone can follow. Checking SSS Contribution online is a long process and most of the non-techie person lost in the process. I made it two parts and simplify, the first part is the registration of the account and the second is the checking. You can proceed in Part 2 if you have already registered your account and start accessing the site using the username and password that you already have. To access My.SSS, individual or corporate members must register for their own username and password, which shall be issued by the SSS. In order to register you’ll need the following beside you, your SSS Number, latest SSS payment receipt, Email address and of course your personal info. Now if you have all the requirements, follow these simple steps. NOTE: To make SSS online registration successful, it is recommended to use Internet Explorer browser while registering or follow this tip if you want use unsupported browsers. Step 2: Click the button with the label “Click here” under Not yet registered in My.SSS? 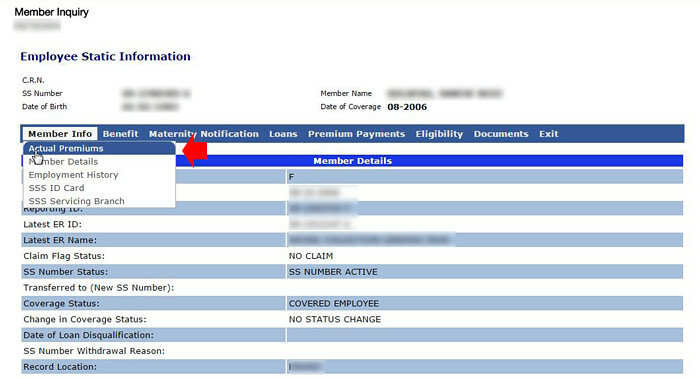 (See screenshot) and make sure that you are in Member section not Employer. Step 3: Select how you register your account, using you UMID card, registered mobile number, SSS number or your latest receipt. For example you select the mobile number registered in SSS, make sure that you have a registered mobile number. If you select the Payment receipt prepare the latest receipt, you will need this in step 4. Step 4: Fill out the required information in the SSS online member registration form and make sure that you are providing the correct information. Make sure that you can open the email address you provide in this form. You can use the following info if you select “Payment Reference Number / SBR No. / Payment Receipt Transaction Number” in the previous step. If you have problem finding the Receipt No./OTC in bayad centers receipt, use this instruction. If Employed, ask your employer for SSS employer ID, select employed then enter the SS Employer ID in the space provided. Step 5: Double check everything and don’t forget to accept the Terms and Condition by ticking the checkbox beside it then click “Submit” button. Step 6: If no errors in your form after you hit the submit button, a confirmation will appear informing you that you have successfully submitted your registration application to SSS for validation. Something like the screenshot below. Step 7: If the registration is successful you will receive a confirmation email from SSS with your Username and Password. When you click the link the screen will popup to enter your desired password, please use 8-20 alpha-numeric characters or your password must be 8 or more characters containing numbers and letters. Now that you have your username and password you can now check your SSS monthly contribution, loan balances, employment history, static info and other SSS online services. Proceed to Part 2 below. NOTE: Recently, users are complaining that they cannot register using 6 Digit OTC validation number from Bayad Centers. If you are experiencing this problem, please make sure that you only entered the last 6 digits, see here how to find the SSS receipt number in Bayad Center receipt. 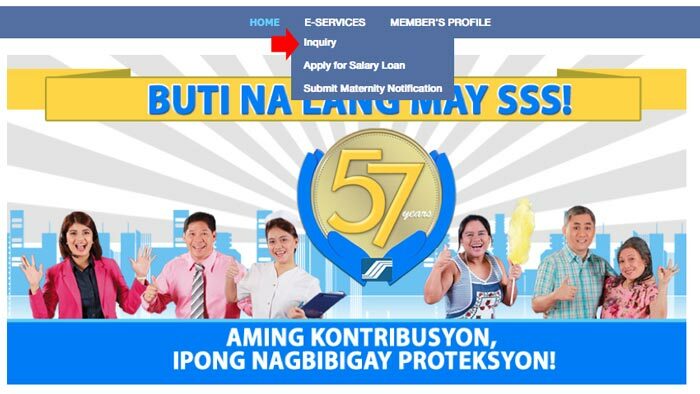 To check your SSS contribution and other SSS inquiry, including loan balances, Employment history, etc. online. You will need to login using your username and password provided by SSS when you register your SSS account in Part 1. Please note that SSS password will expire every 90 days or three months so make sure to update your it regularly. Ok, to check your contribution follow the instructions below. Step 1: Go to SSS Website (www.sss.gov.ph). Login as a member not employer using your username and password. 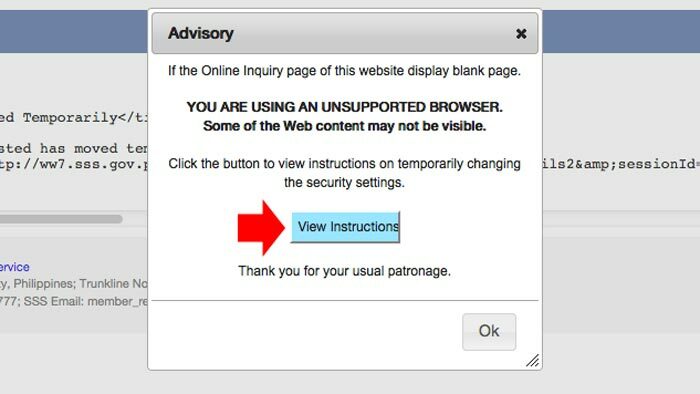 Step 3: If you are using unsupported browsers (Mozilla Firefox, Google Chrome), you will see this pop up advisory. Click “View Instructions” and follow the instructions given depending on the browser you are using. If you can’t follow the instruction, use Internet Explorer. Step 4: Member Inquiry page will appear where you can check everything in your account. Just navigate the menu bar, in the sample screenshot below I will check the Actual Premiums. 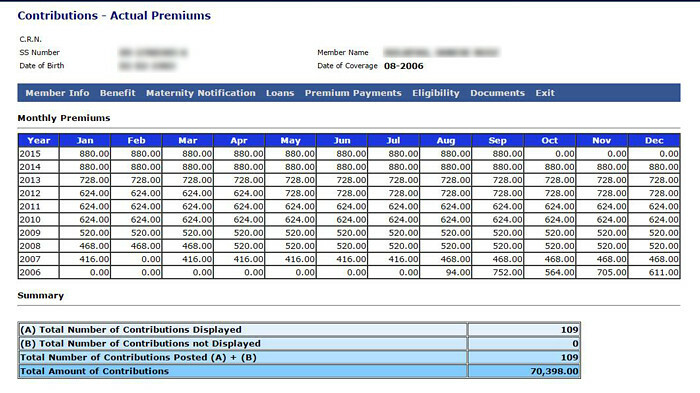 Step 5: Now you can easily check all your monthly contributions starting when you become an SSS member. Disclaimer: I am not affiliated or whatsoever to the Social Security System (SSS), I am also a member and I make this tutorial to help other members who don’t know the procedure how to check their contribution online.